The Marilu Henner Diet is the result of television celebrity Marilu Henner‘s experience of the many years she spent being overweight and feeling stifled by poor health. In Marilu Henner’s Total Health Makeover, she takes readers through her own personal journey of discovery to achieve good health through trial and error, observation, knowledge and understanding. Henner encourages us to develop a ‘sense’ of our body’s needs and to avoid the quick-fix approach to dieting. She places a great deal of emphasis on the importance of detoxification and has created a ten-step program that will help dieters to achieve this goal. She claims that by following her Total Health Makeover program, not only will you lose weight, but you will also live longer, feel more alive and have clearer skin without the need for rigorous exercise. Henner has named her plan B.E.S.T, which is an acronym for Balance, Energy, Stamina and only using Toxin-free foods and products. Eliminate chemicals in the foods you eat. Eliminate caffeine and nicotine from your system. Replace processed sugar with natural alternatives. Limit or eliminate red meat. Practice food combining for efficient digestion. Reduce your intake of fat. Exercise every day and practice stress reduction. Although Henner’s dietary recommendations are fairly strict she says that adjusting your food intake will help to recondition your palate as well as to help you to learn to look at your life from a different perspective. Her wish is that you will not only lose weight but also change your relationship with food. The Total Health Makeover is an advocate of food combining and recommends eating fruit alone and avoiding the combination of protein and starches in the same meal. The general structure of the diet is similar to that advocated in the Fit for Life program. Fresh fruit and vegetables, salmon, tuna, chicken breast, egg whites, nuts, pumpkin seeds, oatmeal, whole grain pasta, tofu, nondairy cream cheese, maple syrup, raw honey, blackstrap molasses, brown rice syrup. Exercise is recommended primarily as a beneficial way to reduce stress. The Marilu Henner Diet says that vigorous exercise is not necessary in order to lose weight and stay healthy. 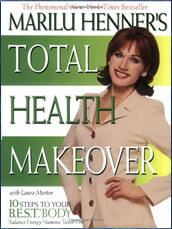 Marilu Henner’s Total Health Makeover retails at $15. Encourages dieters to eliminate unhealthy habits such as caffeine and nicotine. Holistic approach that emphasizes creating balance in many aspects of lifestyle. Includes unique information about the dangerous effects of chemicals, additives and preservatives. Addresses the importance of sleep for good health. Some dieters experience relief from digestive problems when practicing food combining. Restrictive and eliminates many foods. Recommends a lot of soy products, which many health experts do not recommend to be consumed in large quantities. Dieters may experience withdrawal symptoms such as headache and fatigue when eliminating caffeine. Advocates food combining which is unsupported by scientific research. The Total Health Makeover offers readers a balanced dietary and lifestyle approach to weight loss that acknowledges the importance of developing a healthy relationship with food and learning to listen to the needs of your body. What is most lacking in Marilu Henner’s Total Health Makeover is a structured meal plan to assist dieters to incorporate her dietary suggestions into practice. This has been addressed with Marilu’s release of the book The 30 Day Total Health Makeover. I started the Body Makeover (Body Victory) 5 years ago and lost 20 lbs and have kept the weight off for the entire 5 years. Marilu’s food combining works and her tips for every area of life are excellent. I look 10 years younger and have never felt better. Noone believes that I turn 50 this year. She does provide a meal plan for even eating out in her Body Victory Program. I give her program a 5 star! !